The Garden City Hotel in Nassau County on Long Island is the finest hotel outside of New York City NYC. Period. It has it all: Elegant decor. World class cuisine. Impeccable service. Truly one of the finest catering venues anywhere and one that I’ve had the experience of taking wedding pictures at on numerous occasions. 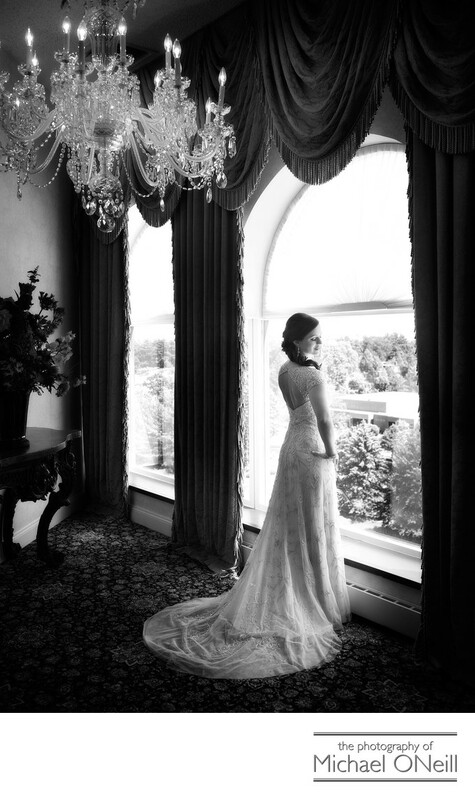 This particular image was captured on a second floor lobby just a few steps from my client’s stunning bridal suite. The bride and her bridesmaids had just finished getting ready for the big day ahead. In a few short minutes she would be walking up the aisle with her father where her groom would be seeing her in her wedding dress for the very first time. On the main floor there is a magnificent lobby with breathtaking decor. The catering section is perfectly isolated from the main hotel area and offers a beautifully appointed grand ballroom along with other rooms for your individual needs. I love creating awesome wedding photography at The Garden City Hotel. My heart starts beating just a little faster when I get a call from a potential client who is planning their wedding here. The opportunities are everywhere in and about the facility to create award-winning images. Let me create one for you.